We do not profess to be legal experts, but we have drafted Equality Schemes for both public sector and voluntary bodies in Northern Ireland and the Republic over the past fifteen years. So, what about the Asher’s case? It is complex. We see no evidence of bias in the media, but we do see challenges around dealing with the detail of the case. Space does not permit us to do this either, but a few points are worth noting. Firstly, equality law in Northern Ireland is a hotchpotch of regulations and orders, primarily following on from provisions made in Equality Law elsewhere in the UK, and in the Northern Ireland Act which gave force to the 1998 Agreement. Consideration is being given to a Single Equality Bill (the UK Parliament passed such an Act in 2010 applying to England & Wales and Scotland, but equality law is devolved in Northern Ireland). Secondly, equality law in Northern Ireland does allow religious organisations specifically to discriminate on religious grounds, including on employment and service. This does not, however, apply to religious people or to people operating indirectly on behalf of religious organisations. Thirdly, consumer law in Northern Ireland does allow a service provider to refuse service; essentially there are two exceptions to this – it may not abuse this to promote reduced prices; and it may not do so in a way which discriminates against someone on the grounds of various things, including (relevantly here) political opinion and sexual orientation. There are several ways in which the bakery could defend itself. It could say that it has a policy of avoiding political slogans at all on cakes it bakes – which, if not demonstrated to be false (say, by past cakes), would almost certainly clear it. It could argue that it did not wish to bake that particular cake simply because it did not want to, but that it was unaware of the sexual orientation of the customer – which would be trickier, but theoretically possible (and seems the most likely line). It could argue that it believes the provisions applying to religious organisations should apply to it – which would surely be rejected. It is a surprise to us that the Equality Commission took this particular case given it is not clear cut and there is a real risk of defeat. However, to be fair to it, either way the outcome will be of significant legal interest. Stormont hits the iceberg – what now? As Northern Ireland’s devolved institutions shudder, where now for welfare reform, corporation tax and political stability? First Minister Peter Robinson and Enterprise Minister Arlene Foster had been planning to head to the United States this weekend to celebrate St Patrick’s, complete with a story of political stability and a pending reduction in corporation tax to 12.5%. The intention was to start on the West Coast, with industrialists there, and then cross over to Washington DC. They would perhaps have said a few words about improved working relationships, seeing off doubters, and even the power of compromise. Oh dear. What has happened is probably a lot simpler than many are trying to make it – from its point of view, Sinn Fein negotiated very badly ahead of the Stormont House Agreement. In return for Welfare Reform (which it had presented as “Tory cuts”), there would be “£2 billion extra spending power” (none of which consisted of truly new money under the Executive’s sole competence) and “an all-Ireland corporation tax”. This was always going to be a hard sell ahead of key elections, and at the weekend’s Ard Fheis it proved impossible to sustain. The Welfare Reform Bill was due to pass Final Stage this week, and would probably have received Royal Assent mid-month. The reason for the speed was to get it implemented as soon as possible, thus avoiding the repayments (commonly but erroneously referred to as “fines” or “penalties”) due for running a different system from the rest of the UK under “parity“. The Bill is almost identical to that passed by the UK Parliament for Great Britain in 2012. However, Sinn Fein’s stated intent to use a Petition of Concern, backed by the SDLP and Greens, would have seen it defeated – thus, the Bill would have fallen. DUP Minister Mervyn Storey thus opted not to move it (i.e. remove it from the schedule), leaving the Bill stalled (but not fallen) pending negotiations. Quite what this means is anyone’s guess. It is well to be prepared for just about anything, but currently we would not expect to see the Bill back before the Assembly this side of the UK General Election on 7 May. The passing of the Welfare Reform Bill through the NI Assembly was directly and deliberately linked in the Stormont House Agreement to the passing of a Corporation Tax Bill through the UK Parliament for operation potentially as early as the 2017/18 financial year. The delay on the former means the latter – implementation of a reduced rate of Corporation Tax in Northern Ireland as per the draft – will surely not now proceed in time for 2017/18. We have remained of the view all along that it is unlikely ever to proceed, as public opinion was already shifting against (in a way to which Sinn Fein and other parties would be likely to respond). The Ulster Unionists have suggested the Welfare Reform Bill was necessary to the Stormont House Agreement, and the Stormont House Agreement was necessary to Stormont itself remaining in operation. This is the same logic as past statements from the DUP leadership. Certainly, the first part of this is true – the Stormont House Agreement did hinge on a resolution to Welfare Reform, and that resolution has now unravelled. Thus, in effect, the Agreement no longer applies unless it can be put back together by a further deal (in practice between the DUP and Sinn Fein) on Welfare Reform. Whether the devolved institutions depend on the Agreement is more debatable. The more immediate problems are financial. Without a deal on Welfare Reform, the Assembly Budget, which was the immediate reason for crisis last autumn, is no longer correctly assessed. The 2015/16 Budget assumed implementation of Welfare Reform halfway through the financial year and removal of repayments for breaking “parity” from then (an effective saving versus the previous year of between £40m and £57m); this is no longer the case. However, it also assumed a significant fund for “mitigation”, which presumably will not now apply either (this would go about halfway to addressing the balance). In the longer term, the unravelling of the Stormont House Agreement may mean the removal of all the UK Government’s commitments – on spending on Shared Education and the Past, on higher borrowing limits, and even perhaps on switching money from current resource to capital to pay past debts. The most obvious victim of this would be the Voluntary Exit Scheme through which 10% of Northern Ireland’s public sector workers are being encouraged to leave service in return for a pay-out; this would no longer be viable without the borrowing and permission to use capital spending. Politically, there is the suggestion that the institutions will now collapse, causing an Assembly Election to coincide with the UK General Election on 7 May. This is unlikely as, strictly, the timescale does not allow it even in the event of immediate resignation. Financially, it is a marginal problem for 2015/16 which can probably be address in Monitoring Rounds. In the longer term, it is a more serious problem, although even then limited by the fact that much of the vaunted “£2 billion extra spending power” was not really extra money. There is a real risk, however, that the “Voluntary Exit Scheme” will be abandoned, replaced by “natural wastage” and surely, in some specific instances, compulsory redundancies. The Assembly’s plenary sessions have been suspended, but the Assembly itself has not. The party leaders met within hours of Sinn Fein’s announcement, as they are collectively responsible for implementation of the internal side of the Stormont House Agreement. In theory, life goes on as normal, just without a Welfare Reform Bill (or, in practice, the financial deal agreed at Stormont House). In practice, it is likely that the British Labour Party’s call for the UK and Irish Government to reconvene talks will be heeded, with Secretary of State Theresa Villiers now coming to Stormont, although quite how much time the UK side would wish to put into it within two months of a General Election is dubious. Stormont is rarely dull – even if sometimes we may wish it were! 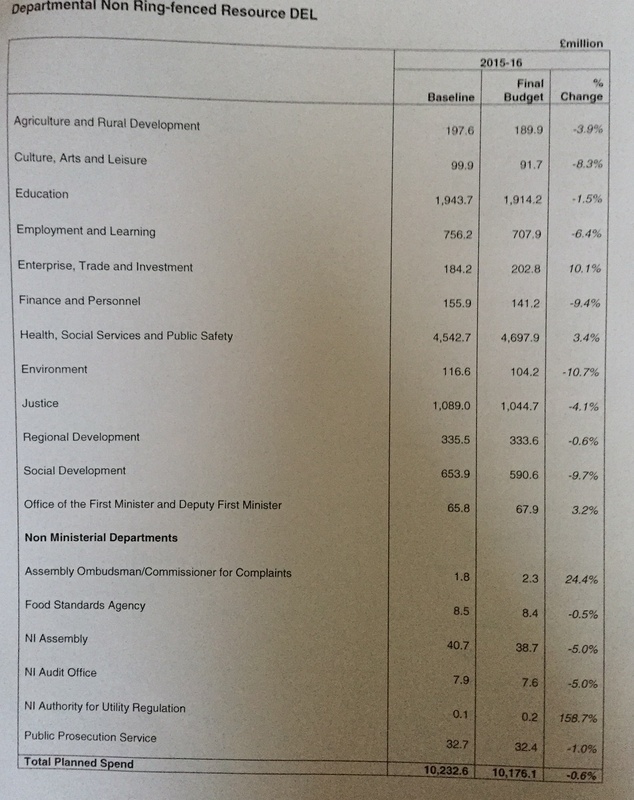 The Finance Minister is currently presenting a revised NI Executive Budget to the NI Assembly, after consulting on the Draft Budget and the availability of some additional funds through Barnett Consequentials and non-use during the current financial year. This follows on from and is complementary to our analysis of the Draft Budget. Figures apply only to Current Resource spending except where specified. The Executive is promoting an “extra allocation” of £150 million for Resource spending – around 1.5% extra. reduced requirements identified in monitoring rounds – £30.5m (although other pressures see this effectively reduced to £28.1m). This is below £150m, and the latter strictly applies to 2014/15 not 2015/16, but there are also some helpful sundries including £10.7m from the revaluation of public sector pension schemes, £5.9m reduction in interest repayments, and £1.3 in increased rates revenue (although there are is also an overcommitment of £4.4m to address in the current financial year, and some other minor negatives). This, plus the ability to use Capital funds to pay back loans and welfare deductions to the UK Treasury, is sufficient to mean that total Current Resource Spending will be only £60m lower in 2015/16 than 2014/15 (assuming that the NI Executive is allowed to keep an unallocated £13.9m to run over). There is also an allocation of £18.7m which had not previously been agreed for European projects, and some re-adjustment on the capital side which does not affect current resource spending directly. The term “extra” is used in the sense that no Department will lose out versus its position in the Draft Budget. The extra money will be allocation additionally to that. The Minister’s Statement also includes the allocation of £30 million held in the “Executive Change Fund”, held aside as money to be bid for for “innovative reform” by Departments. Health receives no “extra” money. It receives £4 million (c. 13%) of the “Executive Change Fund” allocation – much lower than its share of the overall Draft Current Resource Budget of 47%. Some concern is hinted at concerning the “performance” of the Department of Health, Social Services and Public Safety in managing its budget. Education does well, receiving almost half the “extra” allocation (£63m), an increase of 3.4%. It also receives £1.4m from the “Executive Change Fund”, much less significant. Policing receives an extra £20m, which means the overall spend on Justice rises 2%. Enterprise had already done well from the Draft Budget, and an extra £3m goes directly to Invest NI. Employment and Learning, which is likely to merge with Enterprise at the end of the financial year, receives the biggest share uplift at 5% (£33.2m), although this is against a very unfavourable initial allocation. Other Departments receive extra allocations of up to £5 million. Another £5 million is set aside for a “Social Investment Fund”. No revenue raising applies. The average household in Northern Ireland will pay £812 in “household taxes” and zero extra for water (versus £1322 in Scotland, £1433 in England and £1613 in Wales where water delivery is charged extra). Since 2012, Ultonia Language Services has maintained a grammatical and orthographical standard for writing (Ulster) Scots based absolutely on the conventions used in Ulster Scots – A Short Reference Grammar (published by Ultonia Publishing). This is a notification of some minor amendments to formation of past forms. 1. For regular verbs ending in a vowel cluster but not -e, the recommended suffix is now -ed (replacing -d, which is now rejected) – therefore poued not poud. 2. The strong verb frys ‘freeze’ is now considered to be Class I (not Class IV fruis, which is now rejected), past form fris. 3. The strong verb leak ‘leak’ is now considered to be Class IV (not Class II lek, which is now rejected), recommended past form lak. 4. The strong verbs break and speak now take the recommended past forms brak and spak (replacing braek and spaek, which are now rejected). 5. The strong verb present form shuit ‘shoot’ is now recommended to be so written (replacing shoot, which remains optional); this effectively places it in Class II, but it remains listed separately. The presence of a velar consonant after the root vowel is now taken to explain the anomalies in Class II (e.g. fecht-focht versus get-gat) and Class IVb (e.g. break-brak versus beat-baet). As in Scotland, five parties have been locked in negotiations for weeks in Northern Ireland and have now reached a deal which impacts on finances and the political institutions. This is a brief, immediate, overview of what has been agreed. The Welfare Reform Bill will pass the Northern Ireland Assembly by the end of February 2015, to be implemented by the end of March 2016. The faster implementation proceeds, the lower the “deduction” from Northern Ireland’s devolved budget will be – if it takes the whole of the 2015/16 financial year, it will be £114 million. The NI Executive agrees to pay the administration and costs for anything it does differently – it has already been agreed this would cost around £17 million to avoid the so-called “Bedroom Tax”. The Financial Deal effectively means that money may be relatively freely passed between Capital and Resource (current) budgets. The £650 million of “new and additional funding” in fact covers only those things which are partly the responsibility of the UK Government (e.g. Commissions on the Past, Identity, Historical Inquiries and Implementation) or which have to be agreed with the UK Government (essentially for Shared Education campuses). The £350 million of increased borrowing for Capital projects is over four years, and is effectively to cover for the re-allocation of other money from Capital budgets. payment of any deductions for breaching parity on welfare (up to £114m). The deal allows for the devolution of landfill taxes, aggregate levy, stamp duty and most notably Corporation Tax (specifically on trading profit) by mid-2017. The last of these is additional to those powers proposed for Scotland; on the other hand, income tax powers are not proposed for Northern Ireland. The most surprisingly advanced section of the deal is perhaps that on institutions, which essentially allows for the creation of an Official Opposition from the next Assembly Election (2016). The proposal is that instead of forming the Executive automatically “by d’Hondt” (the mathematical formula which determines the number of Ministers for each party and order of choice of Ministry), parties which would be entitled to a place in the Executive would meet to agree a Programme for Government and any party not in agreement would be entitled to opt to go into Opposition instead, with appropriate allocations of speaking rights and research funding. re-establishment (in effect) of the Civic Forum. The Departments are not expanded upon, but it is likely that in effect Culture, Regional Development and Employment/Learning will be merged into others (most obviously Education, Environment and Enterprise respectively). There will be new Commissions and various other bodies on Identity, Oral Archives, Historical Investigations, Information Retrieval and Reconciliation. It is proposed that Parades be devolved, effectively to OFMDFM. Much of what was supposed to be agreed during last year’s “Haass Talks” remains unresolved, mainly handed over to new bodies. There is clear agreement to proceed with Welfare Reform and institutional reform (to allow formation of an Opposition). There is some flexibility over finance, but really very little clearly new. Most notably, current budgetary pressures are not significantly helped. The Public Sector Pensions Bill is currently making its way through Stormont. This is essentially parallel legislation with the 2013 Act which has already gone through Westminster. As it falls under welfare, it is subject to a process known as “parity”. This has led to a lot of misunderstanding (some of it, frankly, intentional). “Parity” was a deal brought in at the time of the beginning of the Welfare system between the UK Treasury and the Government of Northern Ireland. The basic principle is that everyone in the UK should be subject to the same welfare provisions (including pensions); the deal itself is that, although welfare (including pensions, out-of-work benefits and so on) is devolved to Northern Ireland, the UK Treasury will make up any shortfall in the funding of it provided Northern Ireland enacts the same policies. This is entirely separate from the “Barnett Formula”, which dates from the Callaghan Government. That was a formula, meant to be used on a temporary basis, whereby funding (i.e. public spending allocated to what are now devolved institutions) for Scotland, Wales and Northern Ireland would go up or down proportionately depending on how it goes up and down in England in a way devised to ensure everyone in the UK enjoys the same standard of living (on average in each country). So, for example, if health spending rises in England, it rises by the equivalent amount in Northern Ireland – however, for example, Northern Ireland could choose not to allocate this to health, but to education or transport or whatever. Likewise, if spending decreases in England, it decreases by the equivalent amount proportionately in Northern Ireland. Because pensions fall under welfare and thus under “parity” (not “Barnett”), the deal is simple: Northern Ireland enacts the same legislation as the UK Government has and the UK Government will make up the shortfall (roughly ₤250 million per year). However, if Northern Ireland does not enact the same legislation, the UK Government will not make up the shortfall – Northern Ireland would therefore have to find extra money to pay for the pensions under the current arrangements and additionally make up the shortfall itself from existing budgets in other departments, effectively taking ₤250 million each year from health, education, transport, justice, business support and so on. Some parties are making great play of “standing up for public sector pensions” and that is their right; however, they also have to explain to the rest of Northern Ireland where they are going to take the money from firstly to pay for the existing system (which is unaffordable under current arrangements) and secondly to cut ₤250 million from other public services delivered by Stormont. Those are the facts of the matter.